Next month, July, 2010, is a long-awaited month for 2 different events that are somewhat connected to Sasuke. The first one is the 1 year anniversary of the opening of a hotel and restaurant run by the President of Takasui (Nagano's employer) - Hotel ZeroCity and the Restaurant Konpiramaru (which obviously is named after Nagano's boat). July 5, 2010 is the 1 year anniversary. As of right now I don't know any details but there is a celebration of sorts being planned. If I find additional information I'll post it here. By the way I had to add that Kaiou picture. Seems he's the physical representation of the age of the Hotel so to speak... and.. he's a real cutie isn't he? Kawaii!! 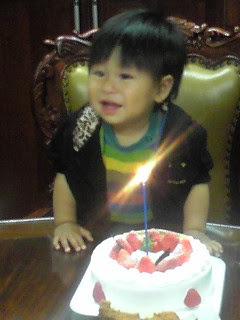 His birthday was the 3rd of June. 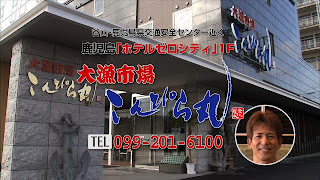 Linking the video again to the Hotel ZeroCity / Restaurant Konpiramaru commercial running in Kagoshima Prefecture again. I wrote about this back in January, 2010 when it first aired and linked to the Takasui site. The 2nd event is also in July, 2010 (though I don't have an actual date yet for that). The long awaited grand opening of the brand new Muscle Park is expected to happen. Monster 9's theme park Muscle Park (specifically the one in Odaiba/Tokyo) will now have a sister park up north in the prefecture of Hokkaido 北海道 in the city of Chitose 千歳市,. For those who remember Hokkaido prefecture in relation to Sasuke.. that's where Sasuke's first Champion Kazuhiko Akiyama 秋山 和彦 is from (prefecture wise though he lives further north along the north coast). The actual park will be OUTSIDE of the Chitose Outlet Mall as opposed to how Odaiba is situated within the actual Decks Tokyo Beach Mall. We've been following the blog that Muscle Park - Chitose provides and following their progress from ground breaking to current status. This latest picture shows the building is already enclosed and now they are working on the inside of the structure. 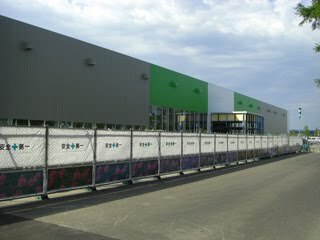 Back in March, 2010 the press in the area has been keeping tabs on the progress as well of Muscle Park - Chitose. The latest article I was able to find came from Tomamin from May, 2010. The size of the park hasn't changed - It is approximately 4000 square meters (over 13,000 square feet) (which they mention is 1 1/2 times larger than Muscle Park in Odaiba) and the total project cost 10 billion yen (approximately $109 million US). If I find out more information on who will be part of the Grand Opening Celebrations you know I'll post about here! Thanks for the blog, there was a few things I missed. For example the Zerocity Hotel anniversary thing (even tho I did get something from twitter but didn't really realize what it was). Fangirlin on the picture. Nagano looking fab in that white t-shirt -*cough* as always! *cough*-, same for Shingo and Takeda (btw Shingo's gonna need a haircut in a couple of months... :P). Glad to see Yamada there even tho he's formally retired. He isn't my favourite but I was sincerely worried for him after the retirement thing, I just hope he doesn't get in depression or that kind of stuff. "O M F G a reply!" Even my mom said he's insanely cute when she saw him. I really hope to see some kickass grand opening for Muscle Park in Chitose, possibly with the full All Stars team there for the event. Well, it's not very likely, but I think at least Akiyama, Nagano and Takeda are gonna be there. Can't wait to see the Sasuke section, and if they got at least a tiny bit of the UL-CLI monster. Yeah the picture we both got came simultaneously LOL! We both had the same reaction as well. He's losing his cheeks and growing into a little boy how cute! I'm trying to figure out who will be in Muscle Park's opening and so far nothing. I'll update when I find anything. With all that additional space, they are certainly going to replicate ULICliff and stuff to entice STQers to go. Bet Ryo and gang are saving up for their summer holiday in Hokkaido. It's nice because they go there with friends. Maybe camp out to save money?